For the past two years, though, Salgado has been stuck behind bars, accused by the state of Guerrero of kidnapping. Guerrero state attorney general Miguel Ángel Godínez Muñoz and other Mexican authorities maintain Salgado crossed the line when the community police force she led detained three cocaine-dealing teenagers and a town official who Salgado claims worked closely with the cartels. Groups such as Mexico SOS that advocate for kidnapping victims and their families have argued that Salgado should not be released without a trial. But among those demanding her release are dozens of human rights advocates, recently elected Guerrero Gov. Rogelio Ortega Martinez, and 13 Mexican senators, along with her supporters and family in Washington state. Mexico’s federal courts dropped similar charges filed against her, according to her lawyers, but state prosecutors in Guerrero continue to pursue it. Human rights activist Nestora Salgado raised her family in Renton. She’s a U.S. citizen and a human rights activist. But most people know her now as a political prisoner. She’s been held in a Mexican prison for more than two years, with limited outside contact. Recently, Salgado was transferred to a lower security facility, and allowed more visitors and phone calls. KUOW’s Liz Jones met up with Salgado’s husband for an update on her case. “Nestora Salgado’s name has become a symbol of resistance for many women struggling … against patriarchal violence and for indigenous communities,” said R. Aída Hernández Castillo in the Mexican daily La Jornada in August. But the state sees her only as a threat. Aug. 21 marked the two-year anniversary of her imprisonment on false charges, with no end in sight. She and her supporters are expanding the struggle to free her and other community police and political prisoners. 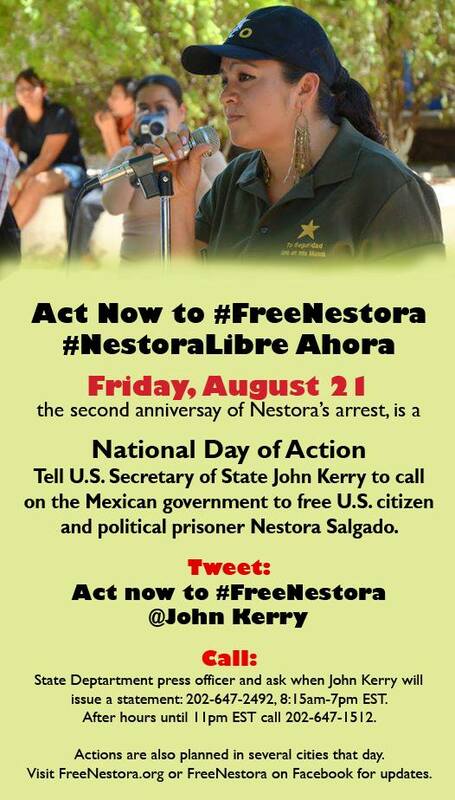 On August 21st, tell U.S. Secretary of State John Kerry to call on the Mexican government to release U.S. citizen and political prisoner Nestora Salgado. 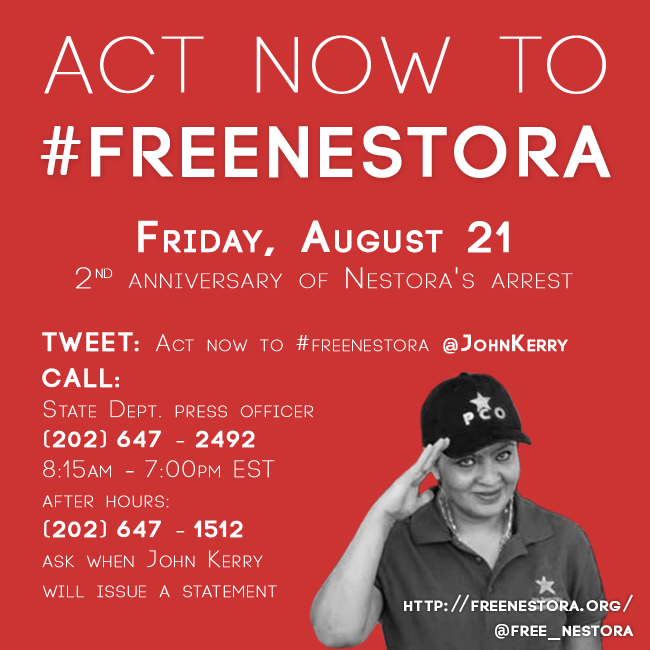 Ask when John Kerry will issue a statement regarding Nestora’s incarceration. Actions are also planned in several U.S. cities, including Aug. 21 rallies at Mexican Consulates in Los Angeles at 5 PM, San Diego at 7 AM and Seattle at 11 AM, plus a week-long series of events in Chicago where Nestora’s daughter, Grisel Rodriguez, will be speaking. Solidarity actions are also planned in Mexico City and a large march will be held in Chilpancingo, the capital of Guerrero. For more updates, follow our Twitter @free_nestora. In one of the highest-profile stories about Nestora Salgado’s imprisonment yet, VICE News offers an informative account of her community policing efforts and subsequent arrest, her recent hunger strike, and the international efforts to end her incarceration (including a reference to this website). We encourage all of Nestora’s supporters to share this news story! We must spread the word if we hope to win her release! An imprisoned U.S. citizen whose case has come to symbolize the Mexican government’s crackdown on community armed police forces in the state of Guerrero ended a month-long hunger strike on Thursday. Nestora Salgado, who emigrated from Mexico and became a naturalized citizen in the US state of Washington, agreed to lift the hunger strike she began on May 5 to protest what she and international supporters called false charges of kidnapping and organized crime. Salgado has been at the center of the struggle over public safety in Guerrero between state officials and grassroots community militias, which have sprung up in differing forms in states such as Michoacan. Read VICE’s full coverage here. June 3, 2015 (San Diego) Activists from multiple community groups arrived in front of the Mexican Consulate at 5 in the afternoon. They came expecting a response from the Consulate on the letter they turned in on Monday. The group is committed to getting a response; their demand is the freedom of Nestora Salgado. While her imprisonment is no longer at the high security prison in Nayarit, but now at a mid-security prison in Mexico City, she remains in a hunger strike, now at the 30 day mark. When they arrived outside the consulate they waited a short time and then they told the security guard they had an appointment with the Consul. They expected to be received by General Consul of Mexico in San Diego Remedios Gomez Arrau. Instead Alternate Consul Fernando Vargas received them. 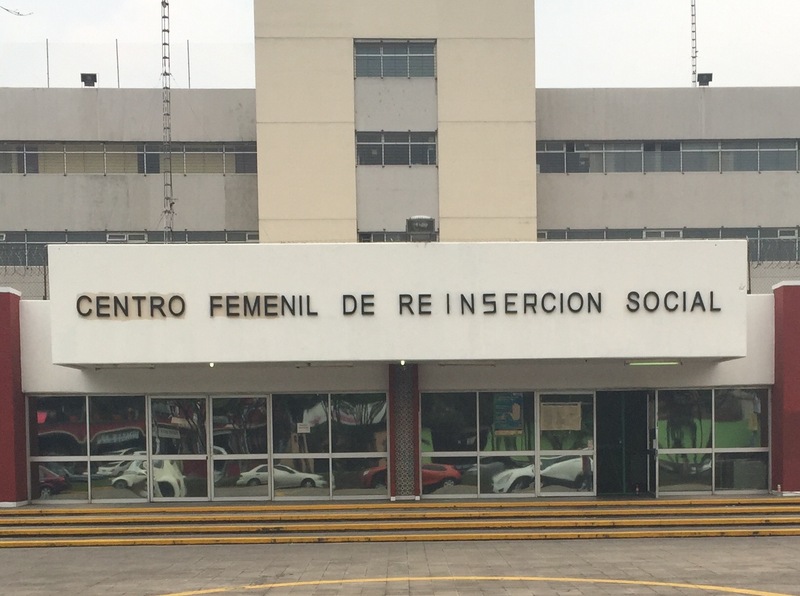 Tepepan Women’s Prison in the southern district of Mexico City. The U.S. Free Nestora delegation visited Nestora today (Tuesday, June 2) along with family members. Spirits were lifted and the determination to persevere was strengthened. We left with a renewed commitment to win Nestora’s freedom!